With stand: 23” in height. Excellent table! 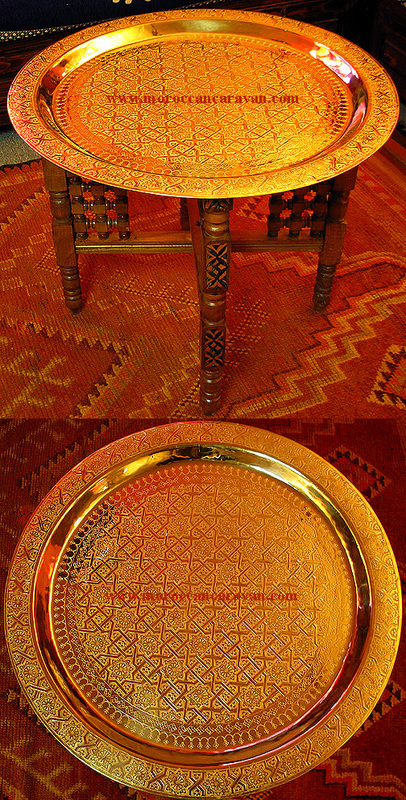 constitutes of a hand shaped and engraved brass tray and a handmade wooden stand with a beautiful arabesque decoration also called musharabi work. It is hand shaped and engraved with intricate motifs by a skillful craftsman in the medieval city of Fes, Morocco. This brass and wood table is ideal for use around your home and since it folds, that makes it even more practical. This table is great as central piece! Also, enjoy it for your tea ceremony with family and or friends. Easy polishing with noxon 7 metal polish or other brass cleaners when needed, found in hardware stores near you, it leaves your tray shiny and protects it. Check out our culture & recipes for a free Moroccan tea recipe. Please Note that Shipping cost is subject to adjustment, up or down, depending on zip codes, this is done after we receive your order.